We keep hearing more about developments made in the photovoltaic field, but we have to keep in mind that this is not the only way in which solar energy can be harvested and used. 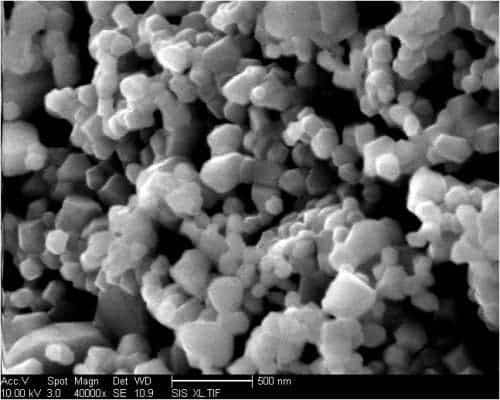 A multidisciplinary engineering team at the University of California, San Diego developed a new nanoparticle-based material for concentrating solar power plants, absorbing and converting 90 percent of the captured light into heat. Engineers at UC San Diego have developed a nanoparticle-based material for concentrating solar power plants that converts 90% of captured sunlight to heat while also withstanding temperatures of up to 700 degrees Celsius. Image credits: Renkun Chen, mechanical engineering professor, UC San Diego Jacobs School of Engineering. The technology works more like a coal factory than photovoltaics, which also means that it would be easier to convert current infrastructure and adapt it to go green. The cost of this energy is about the same as the cheap natural gas, but the technology is renewable and causes virtually no CO2 emissions. Furthermore, it’s also a fairly new technology, which means there’s plenty of room for even more improvements. The material they are using now can also withstand temperatures greater than 700 degrees Celsius and survive many years outdoors in spite of exposure to air and humidity. By contrast, previous materials used for this purpose were not really resilient and needed constant overhauls for high temperatures. The novel development is a “multiscale” surface created by using particles of many sizes ranging from 10 nanometers to 10 micrometers. The surface makes it so that it absorbs more light and also ensures stability at higher temperatures. 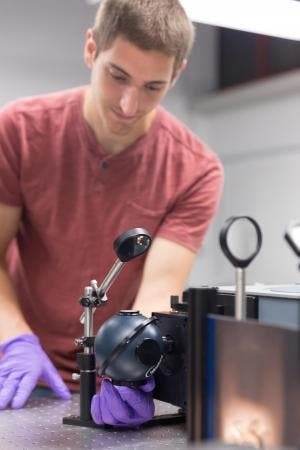 Graduate student Bryan VanSaders measures how much simulated sunlight a novel material can absorb using a unique set of instruments that takes spectral measurements from visible to infrared. This testing is led by electrical engineering professor Zhaowei Liu. Credit: David Baillot/UC San Diego Jacobs School of Engineering. Concentrating solar power (CSP) is an emerging alternative clean energy market that produces approximately 3.5 gigawatts worth of power at power plants around the globe – but the technology is only in its emerging years, so we can expect massive growth in future years. I was saying above that it works in a similar way to coal plants. In coal plants, coal (or other fossil fuels) heat up water which creates steam. The steam turns a giant turbine that generates electricity from spinning magnets and conductor wire coils. The CSP does the same thing, except it heats molten salt. This way, you use much more energy than with photovoltaics, and another advantage is that the molten salt can also be stored in thermal storage tanks overnight where it can continue to generate steam and electricity during the night. The most common approach is to set up a huge mirror array, with as much as 100,000 highly reflective mirrors to reflect sunlight towards a tower painted with light absorbing paint. The problem, as you might have guessed, is that the tower gets very hot – and this is where this material steps in. The interdisciplinary San Diego team spent three years working on this material, but the results are indeed spectacular. Current CSP plants are shut down about once a year to chip off the degraded sunlight absorbing material and reapply a new coating – which means not only do you have a periodic, significant downtime period, but you also have increased costs and carbon footprint. I for one am looking forward to seeing this technology applied at a larger scale – I feel like it’s this type of renewable energy which can make a huge difference.